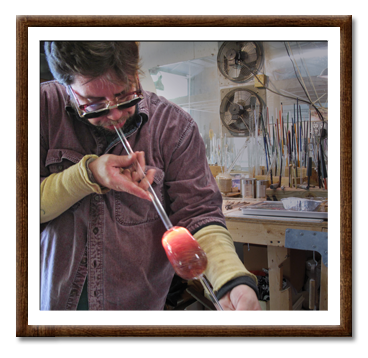 · About Me Since being introduced to glass in 1998 by internationally recognized glass artist, Sally Prasch, glassblowing has been my passion as well as my career. This endlessly versatile medium has allowed me a fulfilling lifestyle including family, gardening, and other interests such as recycling and environmental protection. Click here to learn more about me. · My Process To create each piece of Eye and I Glass jewelry, I employ an ancient glass art form known as lampworking. This style of glassblowing involves specialized torches, delicately balanced flame settings, and molten glass that is carefully worked in the artist’s hands with a minimum of additional tools. Click here to learn more about my process. · Image Gallery Each piece of Eye and I Glass jewelry is a unique hand made creation involving a wide range of materials and long hours in the studio. To stay inspired, I surround myself with the beauty of Vermont, along with the beauty of glass in its many forms: both in finished works and raw materials. Click here for a gallery of glass and studio images. · Awards/Organizations In addition to membership in state craft and trade organizations, I also lend annual support to a number of state- and community-level service organizations. Click here to learn about the various professional and community organizations I belong to. · In The News… From informative tutorial articles to coverage of business growth and public appearances, Eye and I Glass work has been published in a number of local and national publications. Click here to view mentions of Eye and I Glass in the press.